Fri., Feb. 27, 2015, 8:53 a.m.
SPOKANE – Ambassadors Group, the educational travel company that operates the People to People program, will lay off 60 people. The company notified the employees under Washington’s Worker Adjustment and Training Notification Act, which requires 60-day notice of layoffs for large companies. 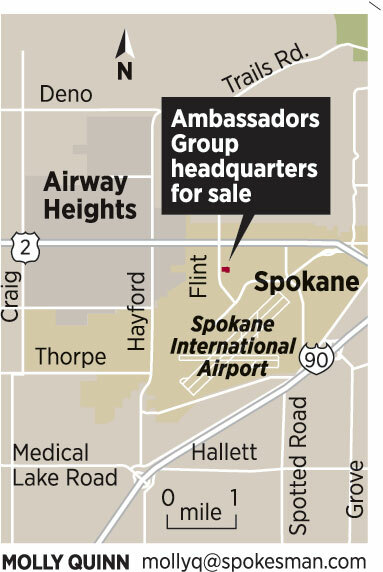 Spokane-based Ambassadors Group laid off 40 people last June. At the time company officials said the job cuts would bring the company’s workforce to 170, with 150 of those people in Spokane. Company representatives didn’t return a call seeking comment on the latest downsizing. Earlier this month Ambassadors Group reported a 2014 loss of $17.5 million, compared with a loss of $7.1 million the previous year. The number of people who traveled on its various programs fell to 16,092 last year from 18,251 in 2013. Northwest Farm Credit Services bought the Ambassadors Group building near Spokane’s airport for $9 million in November. The building, along with 11 acres of land at 2001 S. Flint Road, had been for sale for two years. Posted Feb. 27, 2015, 8:53 a.m.